Showing results by author "Tom Peterson"
If you answered yes to any of these questions, then this audiobook is just for you. Greater than a Tourist: San Miguel de Allende, Guanajuato, Mexico by Tom Peterson offers the inside scope on San Miguel de Allende. Most travel audiobooks tell you how to travel like a tourist. Although there's nothing wrong with that, as a part of the Greater than a Tourist series, this audiobook will give you travel tips from someone who lives at your next travel destination. You'll discover local advice that will help you throughout your stay. 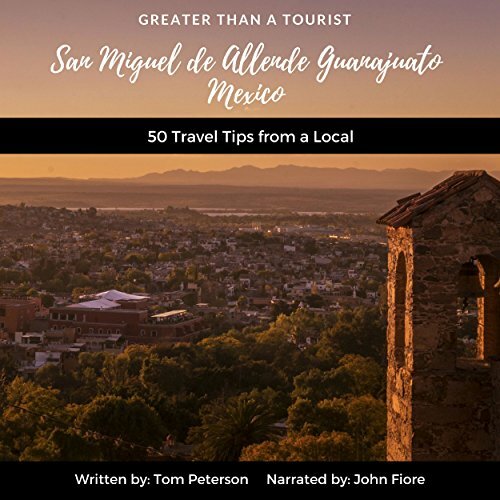 This audiobook will not tell you exact addresses or store hours, but instead will give you excitement and knowledge from a local that you may not find in other smaller travel audiobooks. Travel like a local. Slow down, stay in one place and get to know the people and the culture of a place. By the time you finish this audiobook, you will be eager and prepared to travel to your next destination. Are you excited about planning your next trip? Do you want to try something new? Would you like some guidance from a local? If you answered yes to any of these questions, then this Greater Than a Tourist book is for you. Greater Than a Tourist - San Francisco California USA by Tom Peterson offers the inside scoop on San Francisco from the point of view of someone who lived there for many years.